We needed more storage in the living room for stuff that had been piling up on the floor. 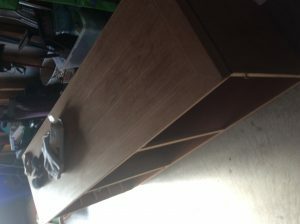 Ikea offers a number of credenzas but the size we wanted was about $500, before taxes. And I wanted something made of solid wood since we would be looking at it a lot and I find they are much easier to repair. Craiglist to the rescue! 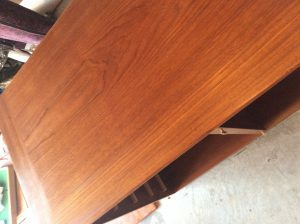 After many weeks of checking we found a Modern Skovby Danish Teak piece. Apparently these are normally thousands of dollars new and approaching $1000 used. The one near us was being unloaded for $200. There was a catch -the owner noted it was being sold for such a low price because it had some bad water stains. No problem. I read that one could often iron them right out! This thing would be as good as new in no time! My buddies and I went and picked it up. It had a lot of water stains. Some over a foot long. And blue paint. And dents and nicks and scratches galore. Luckily, I had planned for such a possibility and bought it with plan b in mind – sand blast it! This summer I picked up a $40 palm sander to learn how to use a palm sander and to refinish the back patio table which was weathered. I put on a breathing mask and went to town on this thing – lightly sanding and buffing this thing to get the old finish, water stains and paint off. Some areas required extra attention because of what appear to be teeth marks from dogs. Woof! Here is a photo of one (of many) water stain on the bottom left corner. Here it is after a light sanding. And the restored surface after refinishing it. 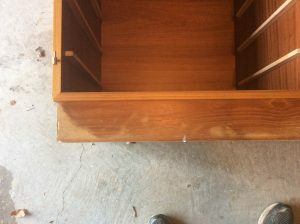 Tried and True Danish Oil to the Rescue. Please be aware that Danish Oil left in the open will light on fire with no sparks at all through a rapid oxidation process. This will start a major fire. Always put your used rags and brushes in water immediately after use. And here is the same model, in rosewood instead of teak, for $2800. And the teak ones go for about $1000 although I found a good one for $685 before shipping costs. Again, these are used prices for these functional works of art. When it was all said and done we have a refinished side board for about $300. Depending on how you count it we either saved $200 (compared to Ikea) or $1800 (for a comparable product) or more likely somewhere in between. Importantly we learned a new skill (the entire family pitched) in and had a lot of fun. And it was cheap enough if it didn’t work out it wasn’t a big deal. We could get two for the cost of a new economy item. Of course you can do much better than this by getting low end furniture used. But this point is that one way to pay tuition expenses is through a cloud of saw dust. And this is of course, an analogy for actual hands on work.